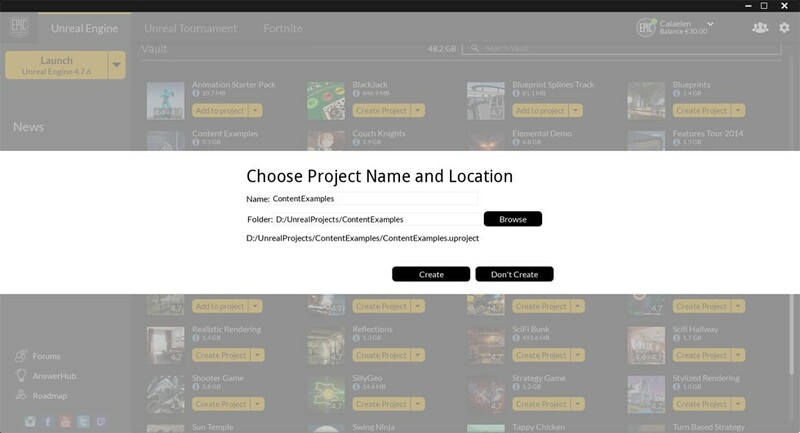 Market Place downloads and learning sample projects are stored in your Unreal Engine 4 Vault Cache directory and are being keep there as unchanged original files. You import them to your projects or start a new one with them. UE4 then creates a copy of theses files inside your project folder. The VaultCache is always located at [GameEngineInstallFolder]/EpicGames/Launcher/VaultCache/. It can’t be relocated by settings or during installation yet (UE 4.7.6). For performance reasons, I have UE4 installed on my start-up SSD drive and my vault contains 50GB of data which isn’t used “directly”. Files are always copied from it to the project folders. Read more about symbolic links including examples at Wikipedia. Recent Update of the UE4 Launcher! Does that also work for asset management, to get access to an asset library weithin your engine content folder? I’m sorry for that. I used these steps on Win 8.1 and Win10 and also with the current UE 4.10.1. You might have miss typed something?